As Charles Murray wrote in his book "What it means to be a libertarian," government can displace but it cannot replace. When government hauls in big taxes and spends lots of money on government programs, people change their behavior. An analogy that Murray uses is that because his wife always makes sure that the doors are locked before going to bed, he feels no need to check the locks on the doors himself. Michael Barone discusses the effects of big government in New Jersey in a recent post to his personal blog site. Aided by the courts and the vast expansion of budgets during the flush 1990s, New Jersey's tax eaters have little by little created a full-fledged example of the kind of regional government that the Left touts these days—a government that forces businesses and residents who have fled the dysfunction of the cities to pay the tab for those urban problems, whether they like it or not. Further, Jersey is part of a cultural shift that is changing politics in many northeastern areas, as some high earners abandon traditional middle- and upper-class fiscally conservative values and vote liberal instead. In national elections, Jersey today is now reliably in the "blue" column. The trend is also showing up in local elections, where longtime Republican strongholds like Millburn, Summit, and Madison have elected Democratic city councils and mayors for the first time. Jersey may soon resemble its neighbor, New York City, as a place where the rich who tolerate high taxes or consider them a social obligation live side by side with the poor, but with a shrinking middle class. In short, it may be that New Jersey, having for years enthusiastically welcomed New York's residents and jobs, is now watching the Empire State take a measure of revenge as its neighbor settles into a familiar high-tax, low-growth inertia. Jersey has caught a bad case of the blue-state blues. Third, many on the political left complain about the disappearance of the middle class, the alleged tendency of our economy to produce hefty income growth for those at the upper end of the economic scale and relatively little income growth for the large number at the lower end. Interestingly, this tendency toward income inequality is most pronounced in states that have been voting Democratic in presidential elections—especially New York, New Jersey, Connecticut, and California. Income inequality tends to be much less in many states that vote heavily Republican. New York, New Jersey, Connecticut, and California have imported many high-income earners and low-income immigrants and have been exporting many more middle-income earners. This process is accelerated when, as in these four states, high-income earners have been eager to vote for Democrats backed by public-employee unions: The same people who have been complaining about this trend have been causing it. Today marks three years since we liberated Iraq from the Ba'thists. This was a huge victory for the forces of good, and just as huge a defeat for the forces of tyranny. What remains to be seen is whether we can hold on to our success. As I write these words, it is not at all clear as to whether we can keep Iraq from sliding into some sort of quasi-dictatorship. We've had two successful elections, and a constitution has been set in place. But violence wracks much of Baghdad and the surrounding environs, and political instability seems the order of the day. These two factors threaten to undo what we have achieved. And we have achieved a lot, despite what the naysayers would have you believe. That we have not consolidated our success is worrysome, but not a cause for too much dispair. Rather, it is more reason than to take stock of our situation, and, if necessary, to adjust our methods. Too bad his own support turned out so fickle. But he was right then, and as such his words are worth repeating. In a symposium on National Review online a few weeks ago, various experts were asked "What do you consider the most important points to keep in mind when considering Iraq three years after the Coalition invasion?" ) In spite of the violence, Iraqis are constructing one of the few democracies in the Middle East. 2) Withdrawing prematurely would leave a vacuum for al Qaeda, Iran, or Syria to fill, destabilizing the entire region. 3) Civil war will be a self-fulfilling prophecy if we buy into the idea, and give up. 4) We're fighting pure evil in Iraq. How many Iraqi women and children have al Qaeda/the insurgents slaughtered? 5) The quickest way to end a war is to lose it; losing would dishonor all those who served — or are serving — in Iraq. 6) Premature withdrawal will be seen as a historic victory for terrorism, encouraging even more bloodshed across the globe. 7) Our allies/friends around the world — as well as our enemies — are watching the strength/durability of our commitment in Iraq. The failure of the Administration to get pictures of the work Coalition forces do — from building sewage systems to training Iraqi forces — onto American national and local TV is a strategic defeat, on a par with the occupation government's failure to maintain order after Saddam's overthrow. The fact that millions of Americans wrongly believe that the 100,000 plus GIs in Iraq have achieved nothing there and are under constant attack by a hostile population could force the U.S. government into a premature withdrawal. After three years, our losses and frustrations serve as proof of how sorely we were needed in Iraq. Iraq has become an epicenter of Islamist terror. But al Qaeda's fear of a free Iraq is the greatest sign that our mission is on target. Militant Islamists are now on the run in Iraq. As we look at the situation in Iraq three years after the U.S. invasion, it might be useful to consider what things might look like if we hadn't invaded. First and foremost, Saddam would still be in power, and we should not underestimate his ability to have caused a great deal of mischief. Human-rights violations would continue. He would be lionized by other despots for his ability to thumb his nose at the international system. 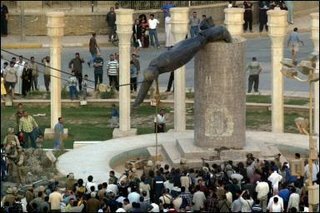 By now, the real "coalition of the bribed," the members of the U.N. Security Council that Saddam was paying off, would in all likelihood have permitted the sanctions regime that boxed Saddam in to wither away. Free of sanctions, Saddam would no doubt now be in the process of reconstituting his chemical and nuclear-weapons programs. Having seen us blink in the case of Iraq, countries such as Pakistan would be less likely to help us in our attempt to destroy al Qaeda. There's no guarantee that things would be better in Afghanistan either. Since the fall of Saddam's regime, there have been both triumphs and setbacks for those attempting to establish a free society in Iraq. The setbacks have been tactical and not strategic in nature. For instance, after the Coalition recognized the mistakes in structuring the Iraqi army, the force was quickly restructured to fight the insurgency. There are now almost 50 Iraqi battalions in the lead fighting the insurgency, with another 80 battalions in supporting roles. The Iraqi security forces have yet to meet their full potential. The political process, while painfully slow, has produced results. The Iraqi people braved the threats and acts of violence three separate times during 2005, and voted in numbers that should shame the citizens of established Western democracies. Success is evident: Iraqis can choose from dozens of television and radio channels, and scores of newspapers. Elections, political debate, and compromise are the norm. When chaos reigns, refugees flee. Why then have more than a million Iraqis returned to their country since liberation? And indeed our troops are doing much good in Iraq, as Bill Crawford details here and here. Gone unnoticed by the anti-war crowd is that American casualties have been steadily falling. Further, anyone who things that the sanctions regime was working perfectly and was not that costly, doesn't know what they are talking about. This AEI paper (hat tip David Frum) proves otherwise. Anyone who thinks that Saddam didn't have extensive links to terrorist groups, including al Qaeda, simply isn't in touch with the facts. I've got about a million links in my bookmark folder about them, but you can start with this excellent summary posted on StrategyPage. For what we have done is nothing short of revolutionary. We have gone to the heart of the enemy camp and destroyed his headquarters. We have seized his leaders and forced the others to flee for their lives. We have grabbed them by the throat and are slowly but surely strangling them. No more are we probing the enemy listening posts and attacking selected, weakly defended targets. No more are we simply skirting around the periphery. No I am not saying everything is peaches and cream in Iraq, or that there are not problems. There are. Andrew McCarthy is pessimistic that we have the political will to "step it up and achieve an unambiguous military victory in Iraq to prevent terrorists from winning a share of power in an outcome that would be a humiliating defeat of the U.S."
We are now in the unenviable position of having to confront radicalized, murderous Shiite militias, who have gained broader Shiite support because of the Sunni-led violence and the lameness of U.S. counterinsurgency operations. The Bush administration would be wise not to postpone any longer what it should have already undertaken -- securing Baghdad. This will be an enormously difficult task: Both Sunnis and Shiites will have to be confronted, but Sunni insurgents and brigands must be dealt with first to ensure America doesn't lose the Shiite majority and the government doesn't completely fall apart. Pacifying Baghdad will be politically convulsive and provide horrific film footage and skyrocketing body counts. But Iraq cannot heal itself so long as Baghdad remains a deadly place. And the U.S. media will never write many optimistic stories about Iraq if journalists fear going outside. To punt this undertaking down the road when the political dynamics might be better, and when the number of American soldiers in Iraq will surely be less, perhaps a lot less, is to invite disaster. Amir Taheri, no raving leftist, believes that there is evidence that other parts of Iraq are quiet because the insurgents/terrorists have gone underground, believing that once George Bush's term is over, the Americans will leave. The argument in Washington these days is about when and how to draw down the troops, not about how to smash the insurgency once and for all. For this we have to blame Bush's low poll numbers, for which the president has no one to blame but himself. Grand Ayatollah Ali Sistani is usually touted as a moderate voice of reason. Yet Andrew McCarthy revealed that he says one thing in English and quite another in Arabic. His view on homosexuality is to the point: "Those involved in the act should be punished. In fact, sodomites should be killed in the worst manner possible." Nice. Were we right to invade Iraq? 1) We, and most of the rest of the world, had good and valid reasons to believe he had stockpiles of WMD. Hindsight is 20/20. This WMD in the hands of Saddam Hussein was too much of a threat to be ignored. 2) The sanctions were falling apart. The situation was bound to fail sooner or later. Once free of the sanctions, Saddam would have restarted every one of his WMD programs immediately. 3) Saddam was 66 years old when captured. He may have lived another twenty years. His sons were under 40 years of age. This regime may well have remained in power for another 40 years. It is simply not believeable that we could have kept him contained for this amount of time. 4) Far from "rushing to war", Saddam had 12 years to come clean. He could have but didn't. Even if you start at Security Council Resolution 1441, which was passed on November 8, 2002, Opertion Iraqi Freedom didn't begin until March 20 2003. That's almost 5 months, more than enough time for a last chance. 5) Saddam had so many links to terrorist groups it would take me all night to set up links to all of the articles I've got bookmarked. Lastly, we have achieved a great deal in Iraq since the invasion, as we saw above with the National Review symposium. We have created a republic, if we can keep it.